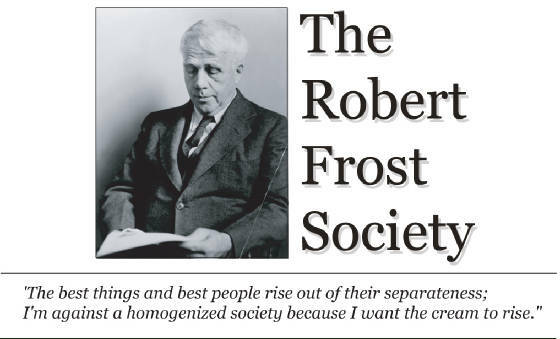 Welcome to the official website of The Robert Frost Society. The chief aim of the society is to promote scholarly discussion of the poet's life and works. The society was founded in 1978 and began presenting programs at various regional and national academic gatherings in 1981. That year, it became an allied member of the Modern Language Association. Today, it sponsors academic panels on Frost's life and work at two annual conventions: the Modern Language Association and the American Literature Association. The Robert Frost Society also sponsors an annual peer-reviewed academic journal, The Robert Frost Review, published each spring. To join the society and receive The Robert Frost Review, click on the button below to pay the applicable amount via a safe and secure online transaction. Checks or money orders made out to The Robert Frost Society are also accepted. Please note: If you wish to purchase previous or multiple issues of the Review, enter in your shopping cart the total quantity of issues you would like to receive. In the checkout process, you will be given the opportunity to add special instructions. Please specify there which and how many issues you would like. For more Frost resources, please visit The Frost Place and The Robert Frost Farm. Join the Robert Frost Society and receive the latest issue of The Robert Frost Review.